In May 2008, my daughter and I were headed to do more genealogical research in Galena, Illinois when Kay passed a sign that intrigued her enough to cause her to turn around and go back – Therapy / Buggy Rides. In these days of hustle/bustle, perhaps a leisurely buggy ride could be therapeutic. 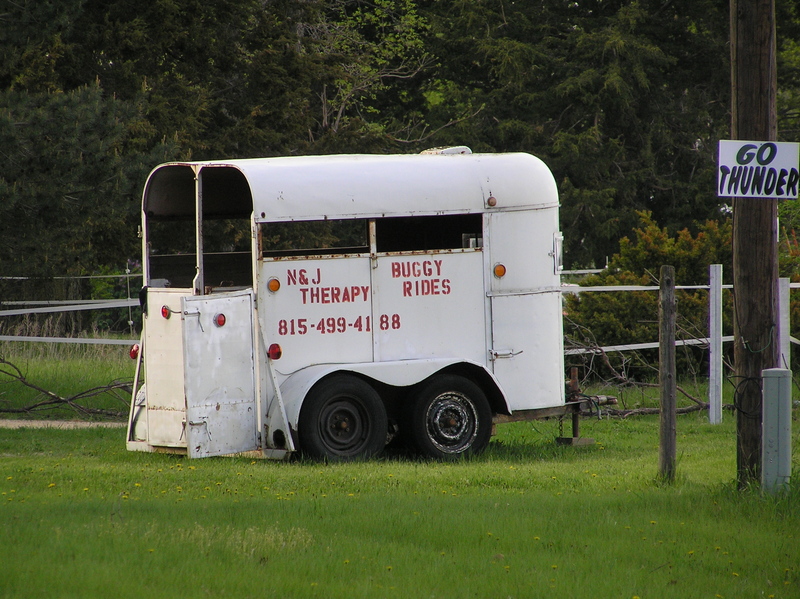 Maybe, based on the trailer (pictured below), they take this buggy to different locations to bring therapy to other communities. As I reflected on this concept, I wondered if I could find more about them on the Internet – I did: http://www.8thstreet.org/n-j/buggy/ They apparently operate on Fridays in Moline. My grandfather, Zedic Hamilton Willis, was born 129 years ago today in Fayette County, Alabama the fifth of six children born to James Franklin and Mary Jane Buckner Willis. Although I apparently met my grandfather at least once, he died before I was two and I have no memories of him at all; unfortunately, my daddy never spoke about his parents so I have no stories to personalize him. Hamp was listed as still living with his father at the time of the 1900 census, his mother having died sometime between the birth of his brother in 1883 and the 1900 census [the 1890 census was destroyed in a fire and we’ve been unable to find any information on his mother, Mary Jane]. Hamp married Mellie Jane Welch, a barely 21-year-old Fayette County girl, on November 15, 1900 shortly before he turned 20. Census information for 1910, 1920 and 1930 all list Hamp as a farmer, generally on land he owned. While they were living in Fayette County, Hamp and Mellie had a daughter, Mary Eunice, in 1903 who died sometime in 1904. Their first son, William Franklin [presumably named for Hamp and Mellie’s fathers – although Hamp’s grandfather was also named William], was also born in 1903. 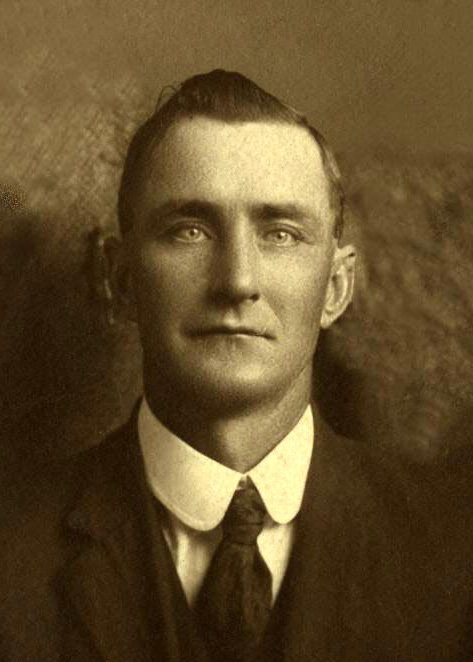 Later in 1904, their second son and my daddy, James Thomas [picking up their fathers’ other names] was born. Hamp and Mellie moved from Fayette County sometime between October 1904 [the birth of my daddy] and March 1906 [the birth of Johnnie] to Itawamba County, Mississippi. They had three more children in addition to Johnnie while they lived in Mississippi: Ernest Bell in 1907, Ruth [one census lists her as Exie, so perhaps a first name] in March 1909 and Rufus Rex in 1910. Leroy was born in May 1913 in Fayette County, so apparently they had moved back to Alabama sometime between 1910 and 1913. They had one more child, a daughter named Rachel, who was born and died around 1914. Alabama is a place known for what is called Sacred Harp [shaped note] all day singings – folks gather at different churches, take picnic lunches [or perhaps pot luck] and sing. YouTube has a trailer for a movie called “Awake My Soul: The story of the Sacred Harp,” which has a little explanation of how it came to be as well as some musical sounds from a singing – helpful for those of us unfamiliar with it . Apparently this is something Hamp and Mellie did. 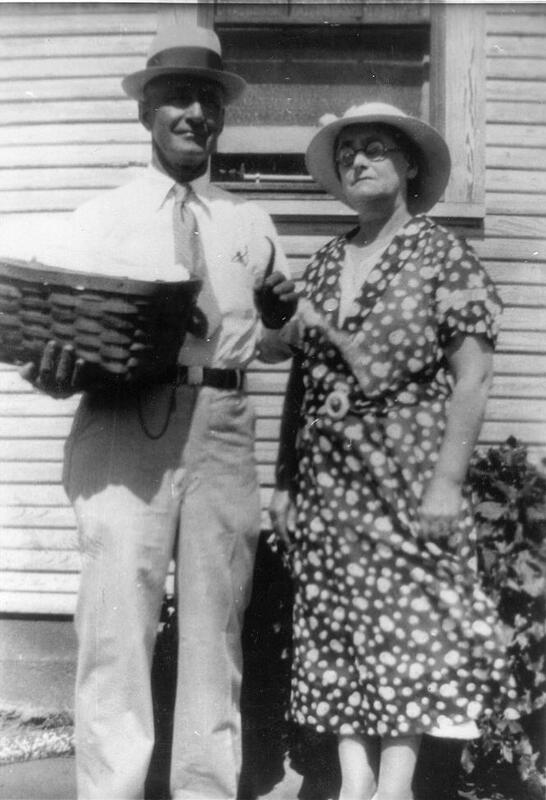 Aunt Rubye gave me a picture of Hamp and Mellie with their picnic basket in hand ready to go to an all day singing; at this time, they are clearly older providing an indication it was something they did from their youth to their old age. The 1920 census lists them as living in Smithville, Monroe County, Mississippi and still farming their own land. My daddy told me he ran away from home around the time he was 15 and had been on his own since that time, which would have been about the time of the 1920 census. Aunt Rubye indicated Hamp’s at least occasional abusive behavior to Mellie and the farm animals was a factor in daddy’s choice to leave; she didn’t mention that Hamp had been abusive to the kids as well, though I gather he was at least what we might call controlling in today’s language. 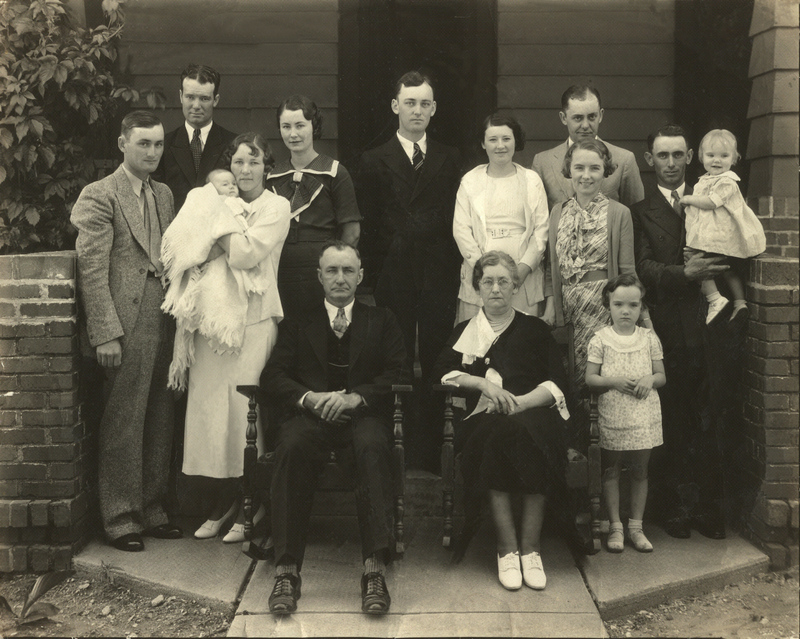 By 1925 they were living in Purcell, Oklahoma and by1929 they were in Lexington, Oklahoma. Their sons, Franklin and Johnnie, both married in 1928 and had sons in 1929 [Ralph and Harold Thomas]. We have a photo of Hamp and Mellie holding their first two grandchildren. For me as one of their grandchildren who never knew them, I find it comforting to imagine they would have held and loved me as well had they lived a little longer. In 1929, Ernest married a Noble girl, Lorene, and they had a daughter, Rita Jo, in 1930. When Hamp and Mellie moved to Texas, Ernest, Franklin and Johnnie all stayed in Oklahoma with their new families. The 1930 census shows them living in Smyer, Texas, with Ruth, Rex and Leroy, as well as Tommy who must have been staying with them for a brief time after he left the Merchant Maries. Ruth, Rex and Leroy all married people they met during those years in Texas; Ruth and Rex married cousins, Lowell and Madge Howard, and Leroy married a neighbor girl, Vileta McCullough. 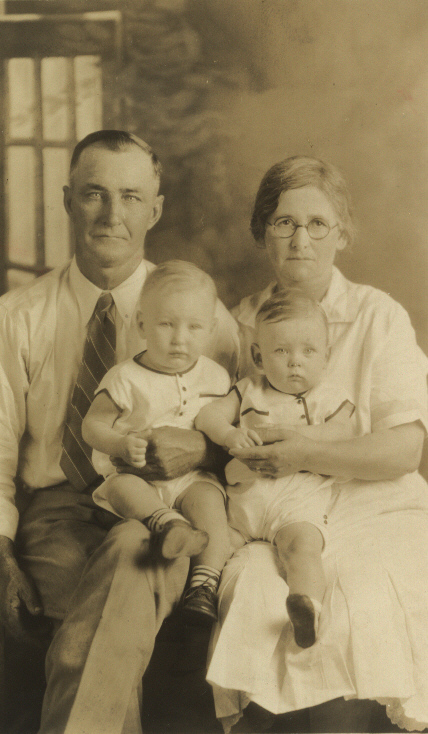 Although Ruth and Leroyand their spouses moved to Oklahoma, Rex and his wife remained in the Lubbock area. The only photo I remember seeing as I grew up was a family photo taken in 1935 presumably on a trip Ernest and Lorene had made to Smyer. By 1936, they returned to Noble, Oklahoma where they were living when Mellie died in 1938. Zed Hamp died on May 27, 1942. He was buried next to his wife in the Noble IOOF Cemetery. They had 7 children who survived to adulthood, 19 grandchildren [the last seven after Mellie died – the last three after Hamp died], and many great-grandchildren. Jacob Wesley Lineberry and Eva Keithley married January 11, 1902 in Hobart, Oklahoma Territory – 108 years ago today. The 1900 census showed that both Jacob and Eva were living in Carterville, Missiouri – Eva in the home of her father and next door to her sister, Violet, and Jacob living in a boarding house a few blocks away. On a trip to Missouri in November 2007, my daughter and I visited the vicinity of Joplin/Carterville to take photographs of the area and discover whatever we could from the court records, newspapers, libraries and historical societies of the area. The small towns surrounding Joplin have currently merged into a larger seamless populated area so everything was pretty close at hand. After visiting the county seat in Carthage and finding land records, we drove to Webb City, a community a little over a mile to the west of Carterville. The historical society there had a genealogy room in their small library that had some of the old newspapers indexed. Sure enough, there was an index listing for Keithley – Eva had sent in a wedding announcement that was printed in the Webb City Sentinel January 10, 1902. Eva’s family had moved from Illinois to Missouri and ended up in the mining town of Carterville. Her father owned a grocery store and, as the newspaper notice said, Eva was working as a night phone operator for the telephone company. Jacob was a carpenter with an entrepreneurial spirit – In January 1901 he wrote his brother that he and a buddy had bought a drilling machine for $1,200 and it was working 75 to 100 feet a week at $1.20 a foot. 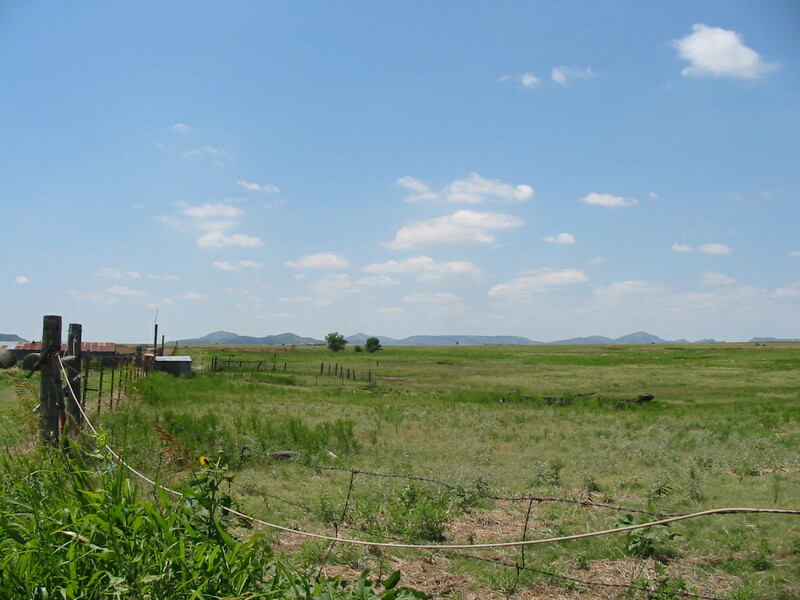 Jacob left Carterville in August 1901 to try to get in on the land opportunities in Oklahoma Territory. Although he didn’t arrive in time to file for the land, he decided to locate in Hobart and capitalize on the exponential population growth prompted by those who had won the land opening lotteries. None of Jacob’s letters mentioned his having a girlfriend but, perhaps his entrepreneurial spirit or brother-to-brother rapport didn’t place it high on the list of things to mention; nevertheless he had apparently been dating Eva, who was 11 1/2 years younger than he was. Although the newspaper print edition shows that Eva was to marry John Lineberry, that is an error. The information Eva left was probably handwritten and, according to the 1900 census, Jacob apparently went by the name of Jake; I would surmise her handwriting may have allowed for interpretation in his name and the general shape of the letters in both John and Jake are similar. 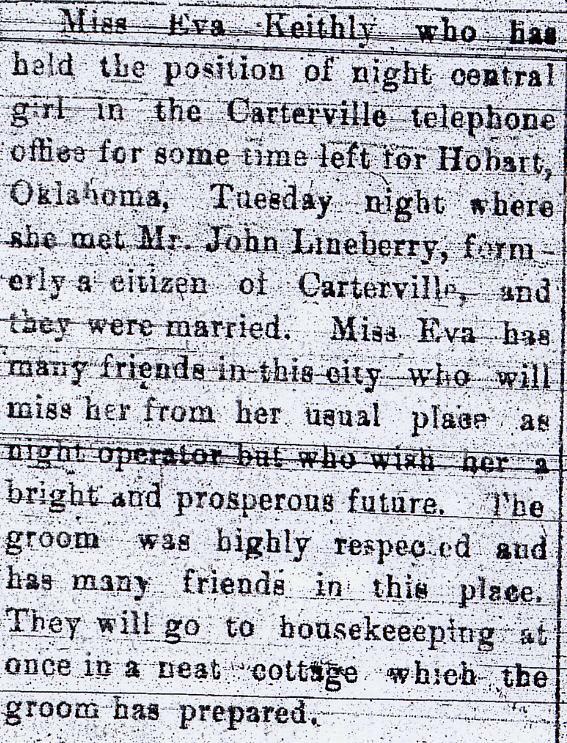 According to the newspaper article, Eva left Carterville on the evening of January 7, 1902 – her 18th birthday. Since she was setting out in the evening rather than early in the morning and since Carterville was on the Frisco line that connected Joplin to Oklahoma City and on to Hobart and Mangum, my assumption is that my grandmother traveled by train to meet Jacob. In researching women at that time period, there were apparently few, if any, restaurants that would serve women traveling alone [in actual fact, they rarely served women, period], which would mean she had to pack foods that required no cooking or refrigeration. Trains in those early years often did not have sleeping accommodations or dining cars and were likely not well heated – it was January! I would imagine her trip was both anticipated with excitement and filled with nerves and, perhaps, fear. Oklahoma was noted to be a wild country with areas of lawlessness and Indians – including all those stories of Indian raids, scalpings and kidnapping women. Additionally, Eva was pregnant [their first child was born five months later on May 12] and I would imagine that, in addition to her nervousness and fear, being jiggled on the train plus being cold, hungry and likely unbathed made the journey tiring and difficult. My brother, sister-in-law, daughter and I made the trip from Hobart to Mangum along what would have been a similar route this past fall and observed the terrain she would have seen out the train window – flat prairie land, unrelieved but for the hint of hills in the distance. We saw some remnants of grasses, weeds and crops, but in January it likely appeared desolate. The reason they married in Mangum rather than Hobart is purely one of speculation. Perhaps it was merely expedient if Jacob happened to be working in Mangum at the time of her arrival. Since I can’t imagine that Mangum was viewed as the honeymoon spot of the west, I also can’t see that Jacob would have met her train in Hobart and kept his expectant bride-to-be on a train for another long ride. January 11, 1902 was a Saturday and, based on the marriage license, it would appear they were married at the Greer County Courthouse in Mangum, Oklahoma Territory. They would then have returned (perhaps after he completed his assignment in Mangum) to Hobart, Oklahoma Territory to set up housekeeping in a home Jacob had prepared for Eva and their soon-expected child.